"I cannot do everything, but still I can do something; and because I cannot do everything, I will not refuse to do something that I can do"
All of a sudden, something happened last week and I had no time to share the good news with you all. It was something I was waiting for months to happens. After couple of self-inspiring posts like these, finally it happened. I GOT A JOB!. I was totally dumbfounded when I got the confirmation call from them. Its something, I have been longing for and Yes, it was right in front of me. I must consider myself lucky that managed to get one in this aggravating job market. So, friends yours truly has moved to the Capital of United States last week. The people over the work place are very sweet and the best part, acc to me is - I can see the very famous 'Washington Monument' right from my cabin window! How cool is that!..hehehe. I am still in the process of finding myself a permanent accommodation in the nearby VA area, am sure will get one soon. I don't have my 'own place' (aka kitchen) to cook, but I had Indira's 'Mango Lassi' made in my drafts, so lets celebrate the occasion with that, Shall we! Off this simple, yet yummy drink goes to lovely Nupur's MBP:Less is More (initiated by Coffee) and gorgeous Meeta's MM:Mango Mania! Enjoi folks and cya soon with ummmmm.. some cookies or brownies! [EDIT]: Do you wanna install the new 'comment form' feature in your blogger?. then Click here. Thanks Nags for the tip. Congrats on your new job. And You are really lucky to see the monument everyday. Congrats! Beautiful view u ve, whenener u want to relax! COngratulation! Welcome to our neck of the woods. Congratulations, and wishing you every success in your career! Thats wonderful! Congrats Siri. Good luck with everything. I love the picture! You know what Satish would say? 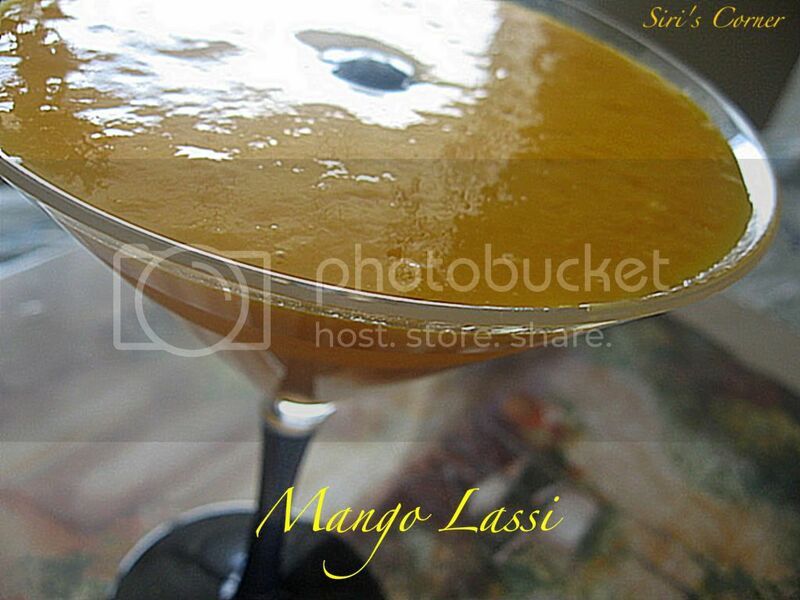 "Poor Mango in a Lassi, it is meant to be eaten neat" LOL - he doesn't let me make stuff like this. Congrats, and wishing you the very best! Thanks ppl for all your wishes! Congratulations!!! Hope you find a really nice place and settle in soon in your new city! Congrats Siri...I too get confident after reading ur older post..Enjoy ur joob!! Hi Siri, Congrats on your new job... You must be soo excited! Wish you all the best, I know you are going to be very so succesful, your energy and enthusiasm are valuable assets to any company! I already tried ur Nargisi-Kofte. it's best and yummy...! Congratulations! You must be really excited about this! I know I am about the job I started next week after a 6 month break and I wasnt even looking too hard! Enjoying the last week of ...well...staying home and enjoying afternoon reading sessions with my daughter..
Good luck! the lassi looks cooling! congrats on your new job. May God be with you in every step you take. Wow, congrats dear! I can imagine your happiness! That's a beautiful lassi to celebrate. Congratulations Siri and it is a nice way to celebrate with lassi! Congratulations Siri on your job and welcome to our area. The Lassi looks too good Siri..